Spend time on board the refurbished La Bohème while passing by the beautiful shorelines. The courteous service and beautiful scenery will fulfill all of your holiday wishes. There are 80 comfortable outside cabins in the La Bohème that offer space for 162 passengers. This classic beauty of the river boasts elegant furnishings and warm colors, to make your stay in the cabins and common areas a real feel-good experience. 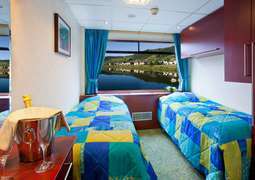 Large panoramic windows or portholes in the cabin provide a unique view of the passing river. Culinary wise the service team on board has a lot to offer. While you can choose from an ample buffet for breakfast in the large board restaurant, at noon and in the evening several courses of European cuisine will be served. Table drinks such as water, beer and a selection of wines are included for you. A popular meeting place to end the travel day in relaxation is the viewing lounge with adjoining bar. The La Bohème has two passenger decks and a spacious sun deck, with numerous sun beds and seating places inviting you to relax. From here you can enjoy a wonderful view or explore the surrounding areas on your own initiative with an interesting excursion. At the board boutique you have the opportunity to purchase a few souvenirs for those at home. In the evening in the lounge, there are regular events with music and dancing inviting you to celebrate on the dance floor. A highlight of any trip is the gala dinner of The Captain where an elegant evening dress is recommended. During your stay on board the La Bohème sporty, casual clothes in which you feel comfortable is reccomended. It is a relaxed holiday atmosphere, which requires no dress code. Only for dinner of The Captain an elegant dress for women and a jacket for men are required. For any shore excursions comfortable footwear is recommended.